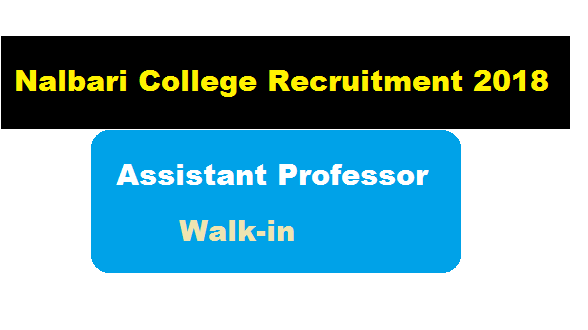 Nalbari College Recruitment 2018 July | Assistant Professor [Walk-In] :- Hello dear Job Aspirant.We hope everything is going good in your side. In this article we will talk about a recent notification of JOB Vacancy in Nalbari College. According to a latest Nalbari College Recruitment 2018 notification, Applications with all testimonials are invited from candidates having latest UGC norms for two contractual posts of Assistant Professors in English (P.G. Classes) under Nalbari College, Nalbari. We have discussed more about this Nalabari College Vacancy in below sections. In this section, we will discuss in detail about Recruitment of Assistant Professor under Nalbari College Recruitment 2018 with all the details and requirements. Educational Qualification: Candidates having latest UGC norms. Non-NET, SLET, M. Phil., Ph.D. candidates may be considered for selection if the situation so demands. Now we shall talk about how one can apply for Nalbari College Latest Recruitment 2018 for Assistant Professor in English. To apply , candidates have to appear in the walk-in interview to be held on 30th July, 2018 10:00 am onwards.